We recently had a disagreement with a vendor we hired to help us with our business. Our first impulse was to argue for “our money’s worth” and demand that we get what we had originally contracted for, but we realized that fighting with the vendor would be a negative drain on our energy and our business. We decided instead to view the event as a learning process and to move on and invest our time, energy, and money somewhere else. Some may view this as giving up and giving in, but we knew it was the right move for us. 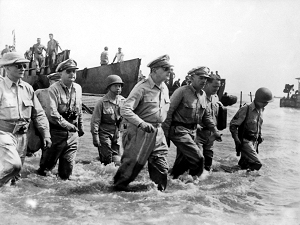 Douglas MacArthur is viewed by many as a great general – and even he knew that, in the face of opposition, sometimes it is necessary to change direction and try again in a different way. Just as important as being willing to stop and change direction is the attitude around the change. How different it might have felt to MacArthur’s soldiers if he had said, “I was wrong, we’re failing, retreat, retreat!” This attitude strengthens a sense of failure at a time when inspiration, passion, and commitment are most likely needed even more. By owning a change of direction as an active choice, we are taking responsibility for where we were headed, as well as where we are headed now. This attitude keeps us from failure and defeat and strengthens our resolve towards the new direction. Where have you admitted defeat or retreat? How can you turn your thoughts around to see your new direction as a new opportunity to advance? Catch yourself when the word “failure” pops into your head and coach yourself into seeing your new strategy as an advance towards what you want. Please leave a comment to share how you have advanced successfully in another direction. If you want support advancing in another direction, contact Robyn at rmcleod@chatsworthconsulting.com.